TEXTUAL MATERIAL COMPILED BY ABDULMALIK MERCHANT. 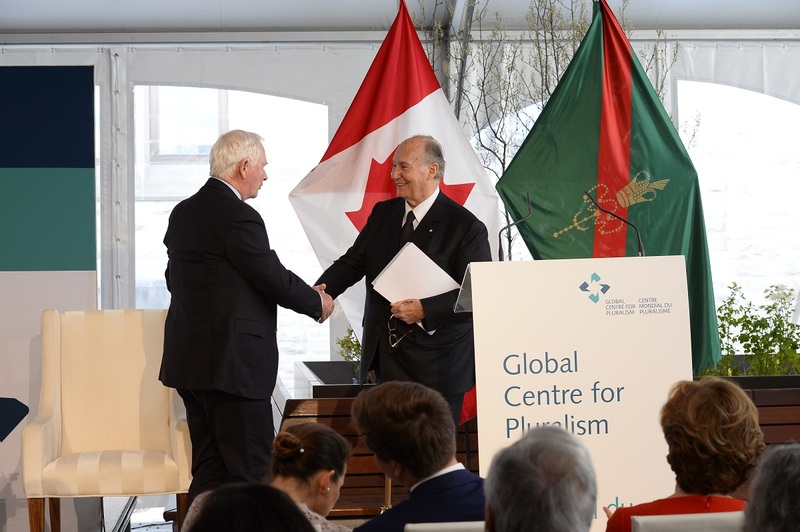 Summary: The International Headquarters of the Global Centre for Pluralism (GCP) was officially opened on May 16, 2017 at a ceremony with His Excellency the Right Honourable David Johnston, Governor General of Canada, and His Highness the Aga Khan. In this special post, we present photos captured at the event by renowned Ottawa based Canadian photographer, Jean-Marc Carisse, as well as excerpts from the Aga Khan’s address. His Highness the Aga Khan and His Excellency, the Right Honourable David Johnston during the singing of the Canadian National anthem at the opening of the Global Centre for Pluralism on Tuesday, May 16, 2017. 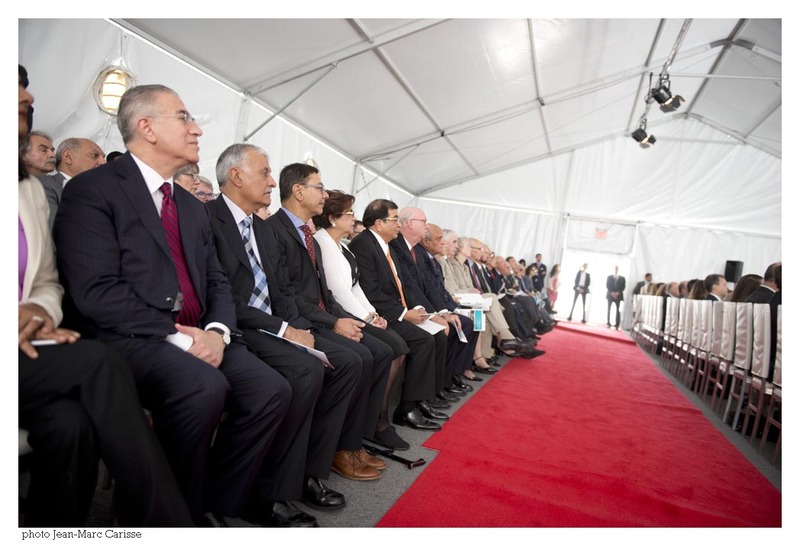 Others in the photo are Princess Zahra Aga Khan and Prince Aly Muhammad Aga Khan in the first row, with Azim Nanji, a member of the Global Centre’s Board of Directors, in the second row immediately behind Prince Aly Muhammad. Photo: Jean-Marc Carisse. Copyright. Music is regarded as the universal language of mankind, and two amazing music performances by Ottawa River Singers, a group of First Nations individuals living in Ottawa, and Orkidstra, an organization that empowers children from low-income families to build their potential through music, marvellously complemented His Highness the Aga Khan’s message that “what happens at 330 Sussex Drive in the years ahead will radiate out well beyond its walls, to the entire world.” The event at which the Aga Khan spoke was the official opening of the Global Centre for Pluralism on Tuesday May 16, 2017 in the presence of Canada’s Governor General, His Excellency, the Right Honourable David Johnston. The soul-stirring performances by the music groups drew long applauses in a ceremony that lasted just under 90 minutes. The Algonquin drummers of Ottawa River Singers add their voices of welcome and the heartbeat of the drums. Photo: Jean-Marc Carisse. Copyright. Children from the musical group Orkidstra performing just before the unveiling of the plaque (see photos below) to officially open the Global Centre for Pluralism on May 16, 2017. Photo: Simerg/Barakah. The Aga Khan applauds the performance by the children’s musical group Orkidstra. Photo: Jean-Marc Carisse. Copyright. The Aga Khan applauds the performance by the children’s musical group Orkidstra. Photo: Jean-Marc Carisse. Copyright. The International Headquarters of the Global Centre for Pluralism at 330 Sussex Drive in Ottawa, shown above a day before its opening, will serve as a global hub for research, learning and dialogue about the values, policies, and practices that support respect for diversity both in Canada and globally. Photo: Simerg/Nurin Merchant. 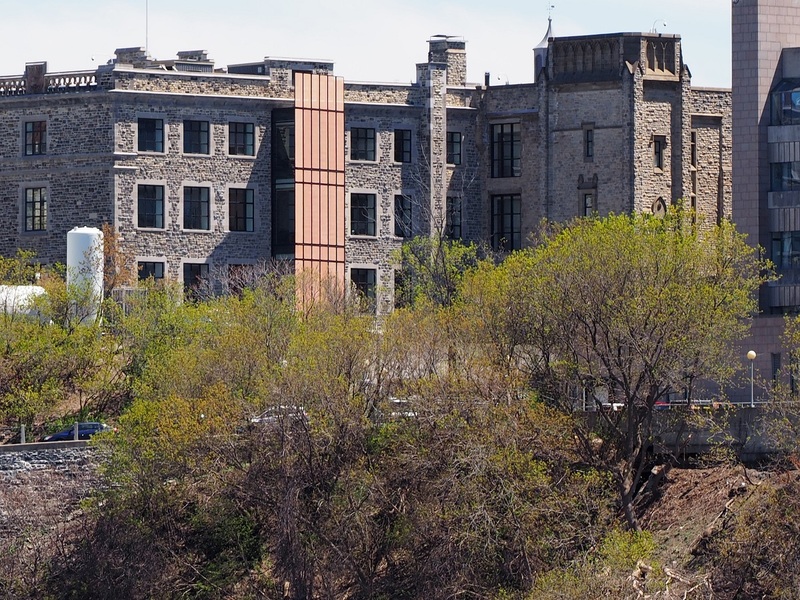 The beautifully restored building is a designated National Historic Site of Canada. It was completed in 1906 and first served as the National Public Archives of Canada until 1967, and then as the Canadian War Museum over the next 38 years. It became vacant in 2005 and the Aga Khan with a $35 million investment has brought this landmark heritage building back to life. The Aga Khan making his remarks during the opening of the Global Centre of Pluralism on May 16, 2017, in Ottawa, Canada. Photo: Jean-Marc Carisse. Copyright. 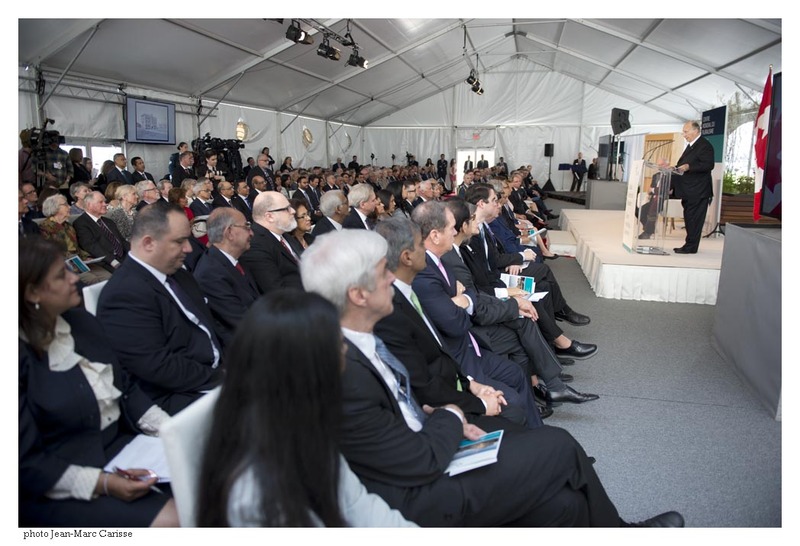 Guests listen to the Aga Khan as he delivers his remarks at the opening of the Global Centre for Pluralism on May 16, 2017. Photo: Jean-Marc Carisse. Copyright. While the Aga Khan mentioned the progress that had been made with the opening of the Centre he also noted the concern about the growing challenges to its mission as nativist and nationalist threats to pluralism rise up in so many corners of the world. In responding to these challenges, he mentioned that the Global Centre for Pluralism has planned a variety of new initiatives. Among them are the new Global Pluralism Awards which will recognise pluralism in action around the world, as well as a distinguished series of new publications. 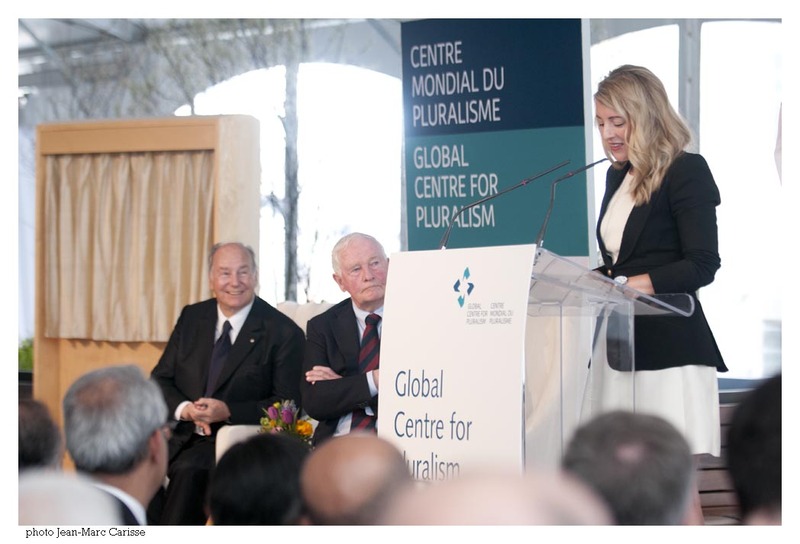 Minister of Canadian Heritage, the Honourable Mélanie Joly, making her remarks at the opening of the Global Centre for Pluralism with the Governor General and the Aga Khan looking on. Photo: Jean-Marc Carisse. Copyright. 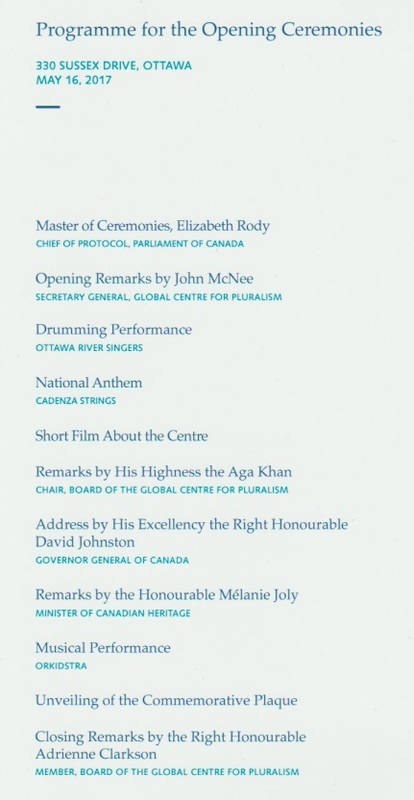 The Aga Khan’s brief speech was followed by a keynote address by the Right Honourable David Johnston, remarks by the Minister of Canadian Heritage, Honourable Mélanie Joly, representing the Canadian Government, and closing remarks by the Right Honourable Adrienne Clarkson, who is one of the director’s on the board that governs the Global Centre for Pluralism. The Right Honourable Adrienne Clarkson giving remarks at the conclusion of the ceremony marking the official opening of the Global Centre for Pluralism on May 16, 2017, in Ottawa, Canada. Photo: Simerg/Barakah. The full list of directors, with His Highness the Aga Khan as the Chair, are: Princesss Zahra Aga Khan (France), The Right Honourable Adrienne Clarkson (Canada), Kofi Annan (Ghana), Iain T. Benson (Canada), Rudyard Griffiths (Canada), Huguette Labelle (Canada), Marwan Muasher (Jordan), Azim Nanji (Canada), Margaret Ogilvie (Canada), Khalil Shariff (Canada) and Eduardo Stein (Guatemela). Joining the Aga Khan for the opening ceremony were his daughter Princess Zahra and youngest son Prince Aly Muhammad. A photo of the actual program distributed to guests and members of media who attended the opening ceremony of the Global Centre for Pluralism. “…the War Museum Building was designed well over a century ago by the great Canadian Architect, David Ewart. For its first half century, it was the home of the Dominion Archives, and then, for another half century, we knew it as the War Museum. For over one hundred years, all told, it was a place where the record of Canada’s proud and confident past was preserved and honoured. The architects, designers, engineers and so many others who have rehabilitated this wonderful Tudor Gothic building have taken enormous care to respect its distinctive historic character.” — Aga Khan, May 16, 2017. A telephoto lens was used to take this close-up picture of the Global Centre for Pluralism from Jacques Cartier Park in Gatineau, on the North side of the Ottawa River. 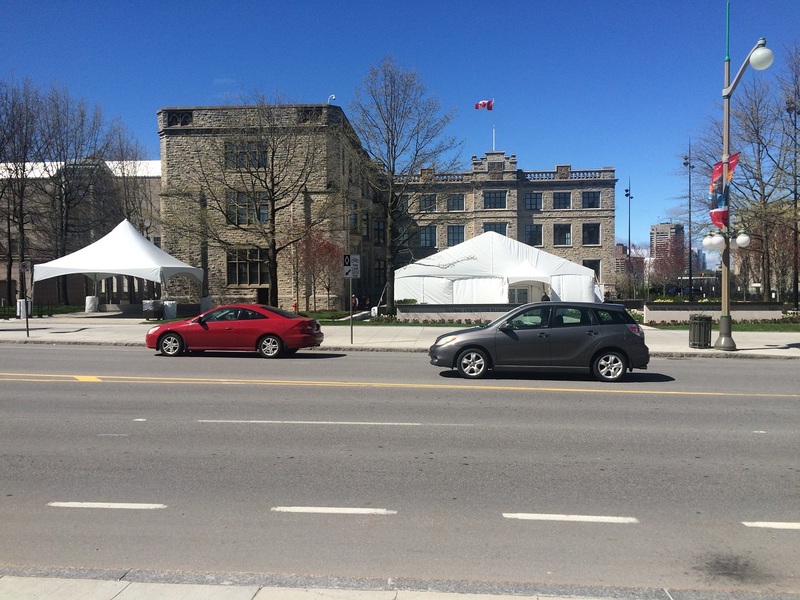 The Centre sits on Sussex Drive alongside or close to other iconic buildings and monuments in the Canada’s capital city, Ottawa. Photo: Simerg/Nurin and Malik Merchant. 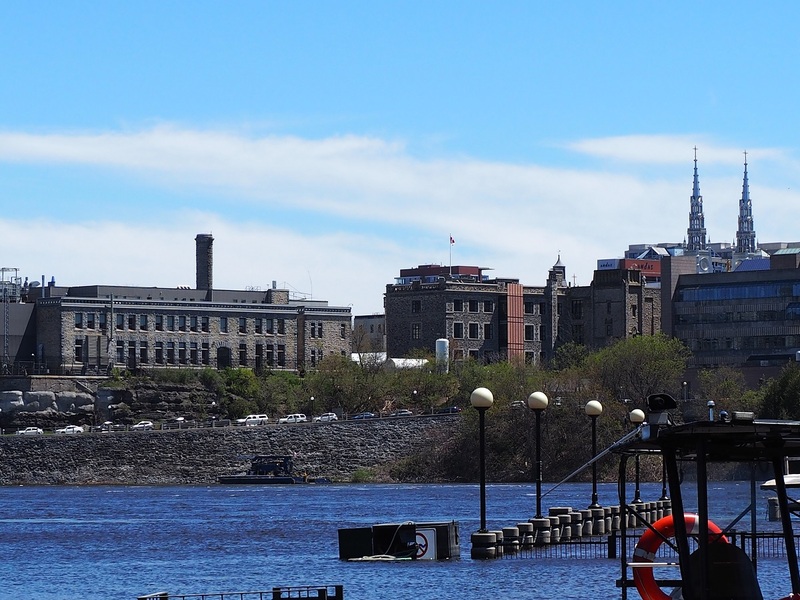 “When I first visited this site, I went across the Ottawa River, to see things from the opposite side. From that perspective, I noticed that many buildings on the Ontario side had, over the years, turned their backs to the river. But as we began to plan, another possibility became evident. It seemed increasingly significant to open the site to the water.” — Aga Khan, May 16, 2017. A view of the Global Centre for Pluralism from Jacques Cartier Park in Gatineau, across the Ottawa River. Photo: Simerg/Nurin and Malik Merchant. “Water, after all, has been seen, down through the ages, as the great source of life. When scientists search the universe for signs of life, they begin by looking for water. Water restores and renews and refreshes. And opening ourselves and our lives to the water is to open ourselves and our lives to the future…Throughout the history of Canada, the Ottawa River has been a meeting place for diverse peoples, originally the First Nations, and then the British and the French, and more recently Canadians from many different backgrounds. It symbolizes the spirit of connection.” — Aga Khan, May 16, 2017. Guests at the opening of the Global Centre for Pluralism. Photo: Jean-Marc Carisse. Copyright. “Let me emphasize a point about the concept of pluralism that is sometimes misunderstood. Connection does not necessarily mean agreement. It does not mean that we want to eliminate our differences or erase our distinctions. Far from it. What it does mean is that we connect with one another in order to learn from one another, and to build our future together. “Pluralism does not mean the elimination of difference, but the embrace of difference. Genuine pluralism understands that diversity does not weaken a society, it strengthens it. In an ever-shrinking, ever more diverse world, a genuine sense of pluralism is the indispensable foundation for human peace and progress. “From the start, this has been a vision that the Ismaili Imamat and the Government of Canada have deeply shared.” — Aga Khan, May 16, 2017. His Highness the Aga Khan invites the Governor General to deliver the keynote address at the opening of the Global Centre for Pluralism in Ottawa on May 16, 2017. Photo: AKDN/The Ismaili. Copyright. “As we look today both to the past and to the future, we do so with gratitude to all those who have shared in this journey, and who now share in our pursuit of new dreams. Among them is someone whom we welcome today not only as a distinguished Statesman, but also as one whose personal support has inspired us all. It is a pleasure and an honour to present to you His Excellency the Right Honourable David Johnston, the Governor General of Canada. Thank you. ” — His Highness the Aga Khan. His Excellency David Johnston, the Governor General of Canada, gives his keynote address on pluralism at the official opening of the Global Centre for Pluralism, as His Highness the Aga Khan, the 49th Ismaili Imam, looks on. Photo: Jean-Marc Carisse. Copyright. A close-up photo of His Highness as he listens to His Excellency David Johnston, the Governor General of Canada, giving his keynote address on pluralism at the official opening of the Global Centre for Pluralism on May 16, 2017. Photo: Jean-Marc Carisse. Copyright. 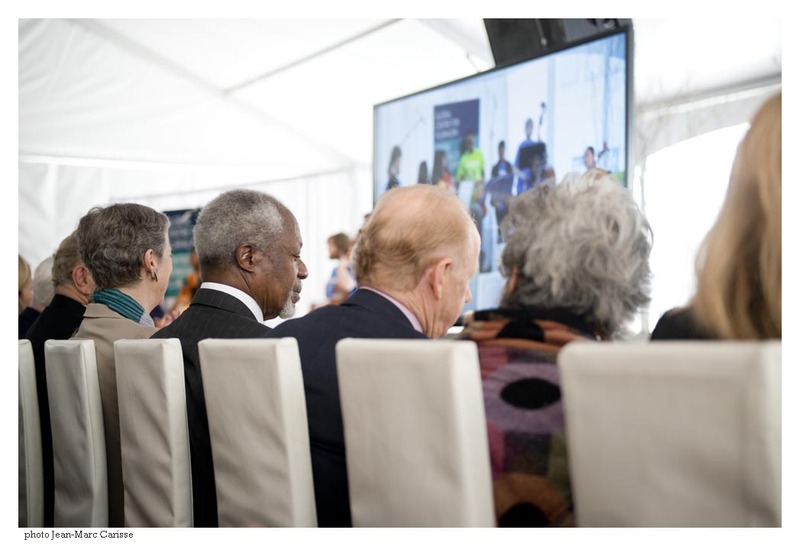 Former UN Secretary General Kofi Annan, essayist and philosopher John Ralston Saul, and his wife, the Right Honourable Adrienne Clarkson, listen to a musical performance by children from the organization Orkidstra during the opening ceremony of the Global Centre for Pluralism on Tuesday, May 16, 2017. Both Annan and Clarkson are on the Board of Directors of the Centre that is chaired by the Aga Khan. Photo: Jean-Marc Carisse. Copyright. His Highness the Aga Khan and His Excellency David Johnston look at each other as they applaud a splendid musical performance by the children’s band Orkidstra during the opening of the Global Centre for Pluralism in Ottawa on Tuesday May 16, 2017. 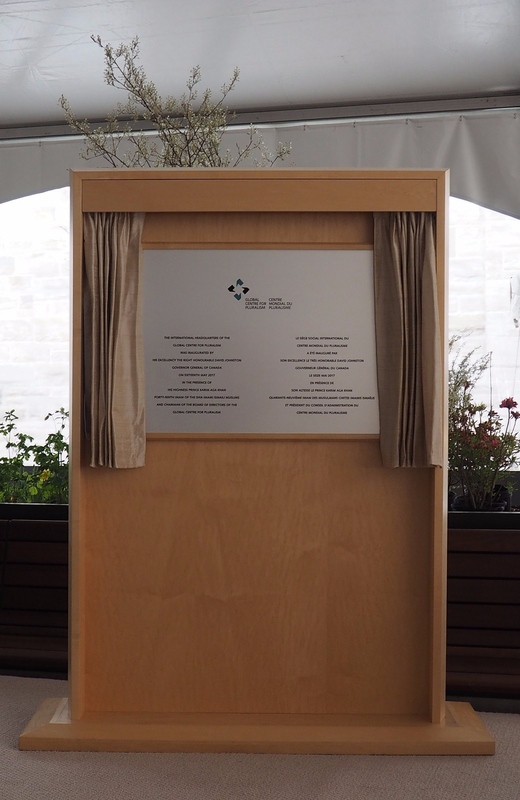 The performance preceded the unveiling of the plaque, below. Photo: Jean-Marc Carisse. Copyright. 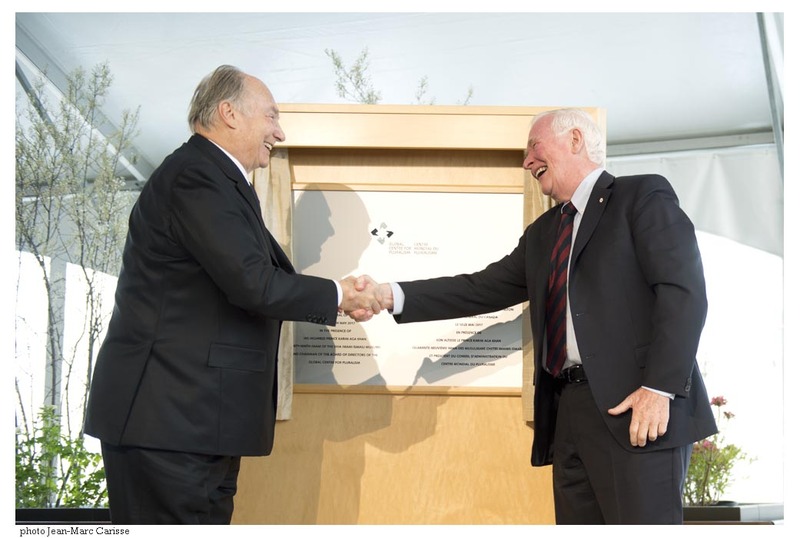 His Highness the Aga Khan and His Excellency David Johnston in a jovial mood as they unveil the commemorative plaque of the official opening of the International Headquarters of the Global Centre for Pluralism. Photo: Jean-Marc Carisse. Copyright. The Aga Khan and David Johnston face the cameras after unveiling the plaque. Photo: AKDN/The Ismaili. Copyright. GLOBAL CENTRE FOR PLURALISM His Highness the Aga Khan warmly greets former Governor General, the Right Honourable Adrienne Clarkson, after she gave her closing remarks at the opening ceremony of the Global Centre for Pluralism in Ottawa on May 16, 2017. Photo: Jean-Marc Carisse. Copyright. 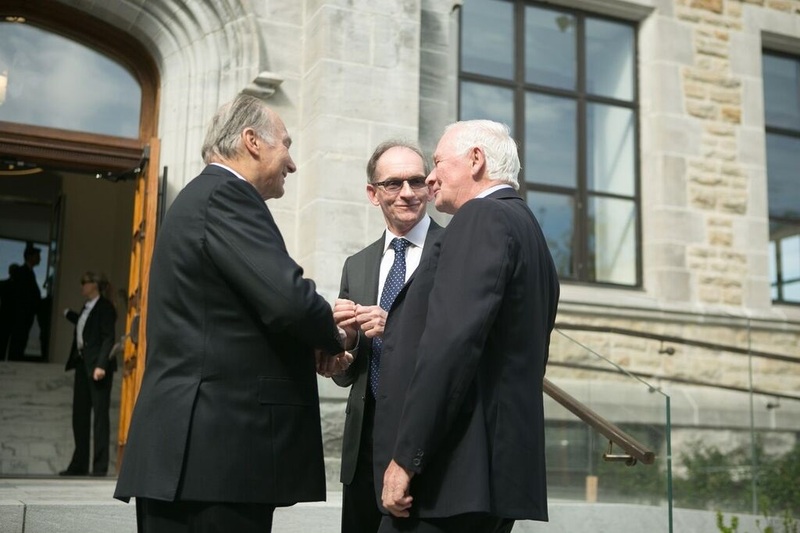 His Highness the Aga Khan, His Excellency, the Right Honourable David Johnston, Governor General for Canada, and John McNee, the Secretary General of the Global Centre for Pluralism share some light moments outside the main entrance of the building opened on Tuesday, May 16, 2017. Photo: AKDN/The Ismaili. Copyright. Date posted: May 20, 2017. Last updated: May 27, 2017 (more photos). Great and wonderful — really enjoyed this post. We pray for your long life for doing this awesome work. God bless you. Just awesome, thank you so much for all your dedication and devotion. Beautiful! Keep up the good work and God bless. Your post is very valuable and we can share it with Canadians at large. I share your website with quite a few and they are genuine admirers of the publishing you do. You portray material in a very touching manner and this has made a great impact on many in our society.Thank you so much for your immense and worthwhile contribution; it is educational and is full of wisdom!